piXvfm partnered with Instructional Designers from the Collision Repair & Refinish group at the University of Toyota to produce a multi-instructional, two-day Body Electrical Diagnosis & Repair course for Toyota Collision Repair Technicians and T-TEN Students (offered through community and technical colleges). 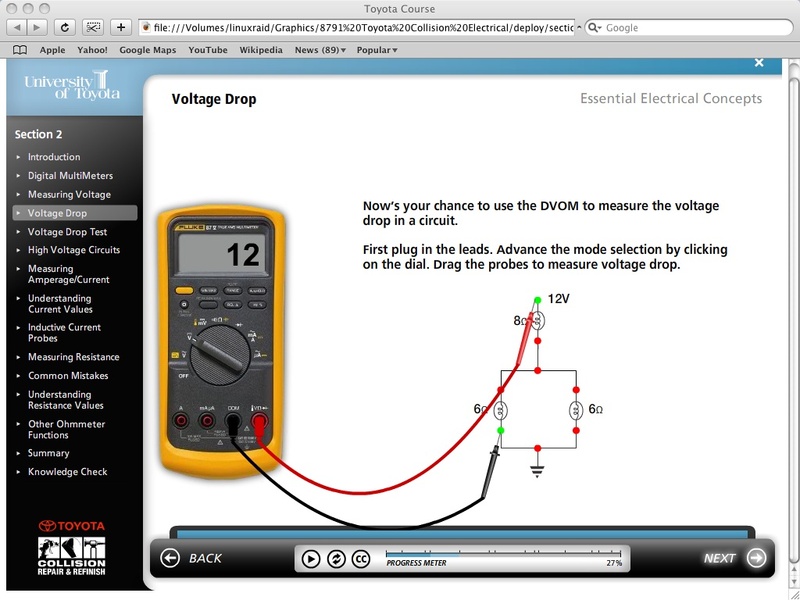 The online pre-course instruction featured animation, graphics and still photography, step-thru real-world diagnostic scenarios, and hands-on, interactive activities testing electrical circuits with a virtual DMM and draggable probes. Knowledge checks after each section prepare the learner for the certification exam in the Toyota LMS platform. Robust navigation tools such as topic menus, progress meter, and playback controls allow the learner to easily step through and replay the lessons. Voiceover closed captioning allows for greater access to program content.